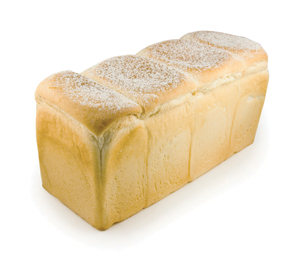 White bread - The most common variety of bread is white bread. It is made from wheat flour (extraction rate of 77%) and is made into many different sizes, shapes and textures. Ingredients such as other cereal or vegetable flours, seeds, herbs or a mixture of these can be added. Wholemeal or wholewheat bread - Made from wholemeal flour (contains all the components of the grain -close to 100% extraction rate), it has become more popular with increasing knowledge of the health benefits of bran and wheat germ. Mixed grain bread - May be made from any combination of flours (e.g. wholemeal or white flour, rye meal or flour), grains (e.g. kibbled grains, wheat germ, whole grains or wheat and other cereals) and seeds (e.g. sesame seeds). Kibbled wheat and cracked wheat bread - Contains or is rolled in kibbled (cracked) wheat grains. Fibre-increased white breads - Made with the addition of bran or other fibre-containing material. Rye bread - Made from a combination of rye flour and wheat flour. Dark rye bread contains a higher proportion of rye flour and rye meal than light rye and is consequently more dense, heavy and has a stronger flavour. 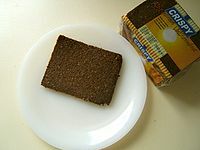 Pumpernickel is a heavy, dark bread made from rye flour, rye meal and kibbled or cracked rye grains. Sourdough bread - Sourdough bread has a slightly sour flavour and a denser texture than regular bread. Sourdough describes the raising agent used to make this type of bread. Damper - Traditionally baked in the Australian bush, damper is a chemically leavened white round bread. Lavash bread - A thin, flat bread made from white wheat flour, yeast, salt and water which is oven-baked on a heated metal plate. Bagel - A Jewish bread where the dough (with yeast) is shaped into a ring and thrown into boiling water before baking. This gives the crust a chewy texture. It may be coated with poppy or sesame seeds and can be flavoured, e.g. raisin and cinnamon.